Here are two of the Portsmouth Corporation venerable TD4 open top buses. When delivered in 1935, this batch had English Electric bodies of H26/24 configuration, but four of these were rebuilt as O26/24R in 1953. No.5, RV 6358, formerly No.115, and No.7, RV 6367, previously No.124, are seen on 26th June 1967 at Southsea seafront. These sturdy performers were ultimately withdrawn in 1971 and 1972 respectively. Nearly all of Portsmouth’s 46 TD4s were quite long-lasting vehicles, many going on for 18-20 years. The four with EEC bodies converted to open-top were even more long-lived, going on to 1971/72 – a massive 35 years! I believe all four are still extant in preservation. This includes one which has had a top cover to more or less the original design fitted, although the upward sweep of the open top front has been retained. These four conversions replaced Leyland Cheetah single deckers on this route – a photo of one at the end of it’s life is also on this site. 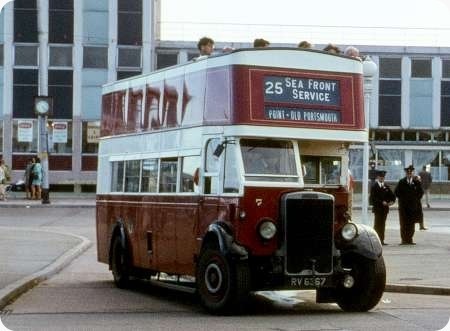 The Southdown Enthusiasts’ Club recently produced an excellent booklet on the history of Portsmouth’s sea front services, and the vehicles used. In 1956, a batch of MCCW Orion bodied PD2s replaced the remaining covered top versions of the EEC bodied TD4s. Poetically, six of these PD2/Orions were converted to open top to replace the EEC TD4s shown here! Thanks for also showing them in the traditional red (crimson) and white livery. I was never a fan of their final style of nearly all-over white with a red band or two. Interestingly, the PD2 conversions were painted white with red stripes immediately on conversion. Those preserved have been re-painted in traditional crimson and white – not strictly authentic, but their owners must agree that it’s much better-looking! Others on this site may like their Gardner and AEC engine sounds, but for me a Leyland TD4 or a PD2 is the best score in the memories of youth. A couple of very evocative photos, with the added fact that little has changed in the second location (Clarence Pier, Southsea)and a lot in the first (by Southsea Castle). It was a pleasure to travel on these venerable public servants and it’s good to know that they’ve all survived. I also loved the roar of these indirect injection diesel engines (sounding at their most bizarre when fitted to the Crossley DD42/7’s). My wife and I would often pick up one of these by the seafront at the Marine barracks and go the Hayling Ferry and watch the activity there for an hour or so. I don’t believe there’s a seafront service any more. although I believe that a company tried one last year, obviously without success. Chris, the 8.6 litre Leyland oil engine was a very smooth running direct injection design, giving 94 bhp at 1900 rpm, making it the fastest revving direct injection unit then available. On my last visit to the Portsmouth/Gosport area about five years ago, I was pleased to see the seafront gardens much as I remembered them from childhood, a time when Portsmouth City still showed the terrible scars of wartime bombing. I am sorry to learn that no seafront service now operates. It was always a magical experience as a child to hear the glorious sound of these buses when pulling away, though back then (1949 to 1952) they still had covered top decks. That was a slip of the pen, Roger, but thanks for correcting me. Not long after going out to work in London, I had a sole experience of a return ride on one of LT’s pre-war STD’s. Leyland TD4’s, with crash gearboxes, they were, nevertheless, good performers, even into Central London. Bodily, they were clever copies of roofbox STL’s to the layman, but to the bus enthusiast, not quite right, internally and externally, producing a surreal ride. Shame one never survived, although there were a couple of failed attempts. Some engines grunt like an O600, some thud like a 5LW or rumble like a 6LW, some thrash and some clatter, but nothing hums like a Leyland 8.6! For sound, bodywork and livery I’d have one of these Portsmouth TD4s among my Desert Island Dozen. Pity that considerations of fuel economy, clean running and power output have conspired to make the toroidal piston cavity almost universal, because it seems that the smoothness Roger describes results from the flowerpot cavity of the 8.6. For three years after the introduction of this legendary engine AEC continued to struggle with Ricardo-head indirect injection with its cold-starting difficulties. Does anyone recall the sound of London Transport AEC 8.8-litre engines? I don’t, as I wasn’t there, but Graham Green tells me that they too had flowerpot-cavity pistons, so I imagine they must have hummed like the Leyland 8.6. Seaside open-toppers often survived way beyond the average vehicle’s service life. Is that because they were cherished by the operator and given whatever overhauls were necessary for a new CoF even when an accountant would raise an eyebrow, or were the fitness conditions less stringent for buses plying a flat seafront route at 20mph? But a counterexample was prewar Southern Vectis CDL 899, which at over 60 years of age ground doggedly up to the Needles Battery, at about 450ft, several times a day. One aspect was that they probably only worked for 4 months a year, so had less hard lives on an annualised basis. I also wonder if there was some affection for these pre-war buses, retained long after the war before conversion, and, in effect, museum pieces. I’m not so sure that post-war open-toppers, in general, have fared so well. You are of course right Chris, they were only used for 4 months of the year and were stored under dust sheets in the side garage at North End through the Winter. In addition they were not sent out in the rain – as the timetable of the time stated – this service will be augmented or withdrawn depending on demand and the weather. How I agree with Ian on the subject of the pot cavity Leyland oil engine in TS and TD chassis. Originally of 8.1 litres capacity, the engine was derived from Leyland’s contemporary petrol unit and inherited its overhead camshaft design concept. This contributed to the smooth running characteristics, albeit at a slight penalty in longer overhaul procedures. In fact, when later bored out to the familiar size of 8.6 litres, the E102 unit proved to be very reliable, and this apparent maintenance complexity was unimportant in practice. Coupled with the "silent third" gearbox, which had sliding mesh engagement for first and second, but helical constant mesh for third, the TS and TD buses thus equipped were, to my mind, the most musical psvs of all time. The song of one of these pulling away from a stop was a delight upon the ear. My experience of the AEC pot cavity 8.8 litre engines was limited to a very few rides upon the 10T10 Regals from Selsdon when Green Line routes 706 and 707 were introduced on the 26 June 1946. I was then four years old, so such memories are justifiably hazy, and one month later I went to live in the very rural Kent village of Doddington, which, to my joy, was served by Maidstone and District Leyland TS Tigers. Route 28 ran along the valley to Faversham with utility rebodied petrol TS2 buses, and these hissed along almost silently. Route 58 ran to Sittingbourne with TS7 (or possibly TS8) Tigers, and the glorious sound of these wonderful machines ascending Chequers Hill remains in my memory to this day. Perhaps our professional musician contributor, David Oldfield, might wish to offer a view on this subject. Much of our pleasure in old buses derives from their distinctive sounds, a quality that utterly eludes the present day crop of routine rattle boxes. To me, it’s like comparing Monteverdi with Heavy Metal. An interesting additional point arises from this discussion. So effective was the prewar Leyland 8.6 litre oil engine, that, when Crossley and Daimler designed their post war diesels, they copied exactly the 4½ ins bore and 5½ ins stroke of the Leyland, though not the pot piston cavity. Neither engine remotely emulated the success of the Leyland. When I first encountered the new post war PD1/PS1 Leylands, I was sadly disappointed with the sound of the E181 engine. The old Stradivarius sounds had been replaced by the rattle of a Gatling gun. I’m surprised no-one seems to have mentioned the reassuring clatter of an exhaust brake: perhaps they are post 1970: in which case I’ll still settle for the melodious sound of a CVD6, hunting and then tunefully gurgling away. I too discovered the music of prewar (and postwar) Leylands at the age of four, in my case from Manchester TD5s and PD1s respectively. As Roger says, the sound of a TD pulling away from a stop is something very special, and I was so taken with it that (not knowing what they were really called) at that age I gave them a name based on the sound they made. Part of the magic came from clutch judder transmitted into the gearbox. In my experience the rapidity of clutch judder depends on gearing, and the TD must have had a very low second gear to sound the way it did. Manchester, however, did not have the "silent third" gearbox, but specified a special version with cellos and trombones in third gear as well as second (first was never used). Not 100% sure, but I suspect the sound Roger Cox refers to may be like that of the Lincoln TD7 which is to be found on the Old Bus Sounds page. I remember it on many of Barton’s rebuilds around the time of our move to Long Eaton in 1954 – not to mention their ex-Leeds Regents and TDs. The Lincoln TD7 is indeed capable of making all the right noises – I had a nostalgic ride on it last November. I don’t think there’s a second-gear start with clutch judder on this recording though. However, there is a nice burst of second gear from 6:36. Following on from Paul Haywoods posting of a Midland Red Regent II I thought you may be interested in a picture of one of the types of vehicle produced by the Birmingham and Midland Motor Omnibus Company itself under its SOS manufacturing name, possibly standing for "Shire’s Own Specification" – L. G. Wyndham Shire was the BMMO Chief Engineer – though other interpretations have been suggested. This vehicle is a coach of the SLR type, which stood for "Saloon Low Rolls Royce", indicating a comparison with RR luxury rather than any mechanical involvement of that firm. 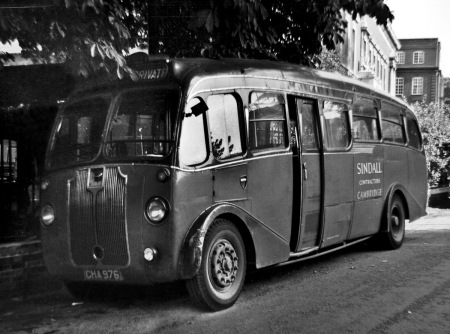 The SLR coaches, of which fifty examples were produced in 1937, had English Electric C30C bodywork, and were fitted with six cylinder RR2LB petrol engines of 6.373 litres capacity, though these were replaced by Leyland E181 7.4 litre diesels in 1948. All the SLRs were withdrawn in 1955, and, although the spares availability for second hand BMMO manufactured vehicles has always posed problems, some, at least, of these coaches found further work elsewhere, including places like Cyprus and the Canary Islands. This one was photographed in Cambridge in 1959, when it was owned by Sindall, contractors. Unfortunately, on a bright, sunny day, the vehicle was parked with its front end deeply in shade under trees, which rather taxed the limitations of my trusty Brownie 127 of those days. I’ve never seen one of these before, in the flesh or in a photo and didn’t even know they existed. They would just have gone out of service by the time I was in the RAF in the Midlands. The radiator grill is pure Maudslay SF40 in style and you can see the follow-on post-war, in the superb lines of the C1’s. I also liked the C5’s, too. Do you recall, Roger, if it was still in BMMO’s livery? It looks like the post-war livery of red/black, but maybe the pre-war one was different. 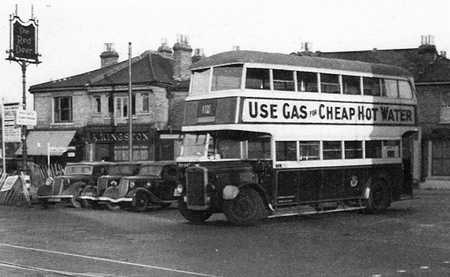 1937 would have been EE’s period of diversification into coachbuilding – let’s hope the bodies were sounder built than their earlier attempts with bus bodies! The chassis did not receive new bodies, it would seem, so maybe they were, although maybe they were rebuilt! Of course, coaches were often laid up for the duration of the war, or led easier lives as ambulances. Nice photo, overcoming the challenging conditions very well. Splendid photo, Roger, of a delightful looking machine. It certainly looks to be in its MR black and red coaching livery as I doubt if a contractor would have "thoiled" the cost of a dual-colour repaint. It amazes me that in 1937 MR were building these almost art-deco coaches when the rest of their huge fleet of single-decker buses were little more than throw-backs to the 1920s, still using slot-in destination boards instead of roller blinds. How things changed after the war. 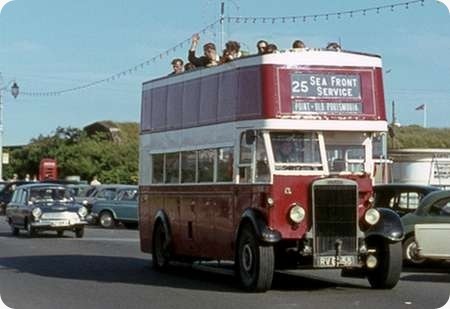 Unfortunately, Chris, at this distance in time, I cannot positively recall the livery, but it certainly looks like the standard post war coaching red/black, which this class certainly received – the book "Midland Red Buses" by M.W. Greenwood has two pictures of these coaches in that livery. The bodies must have proved to be reasonably sound as they lasted for 18 years with Midland Red, and then had several more years in secondhand afterlife. After their long service life a number of these old-timers were converted to dual-control and continued in the driver training roll. On leaving the RAF in 1957 I actually had my driving assessment on one at Bearwood prior to my PSV test on a D7 three weeks later. Thanks Roger for the added info I was not aware of. Just to continue the "SLR" interest, came across this interesting snippet- http://www.flickr.com/photos/ -it is amazing to find these old birds still able to give useful service well after their sell-by date. Looking again at Roger’s post I think the fleet number was 2424, I stand to be corrected – or shot . . . .
Two excellent photos at opposite ends of their lives. Interesting that David’s gleaming one shows the coach with a different grill and stylish art deco SOS badge! Midland Red’s coaches certainly had style either side of the war. I did my National Service in Egypt and then Tripoli. I was amazed to see these lovely old coaches in Tripoli – I think they were conveying US Airmen to and from Wheel US Airbase. 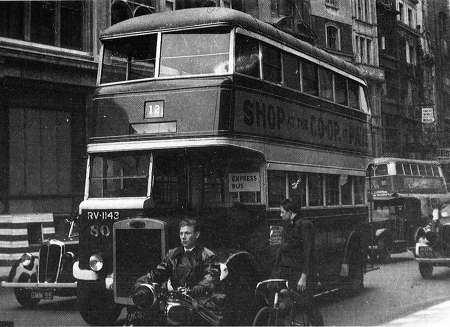 The RASC operated a rickety Morris Commercial bus service for British troops. I have always been a Midland Red enthusiast and enjoyed going to Birmingham from Wolverhampton on the top deck of a FEDD – a wonderful experience. Eric there is a FEDD posting in the pipeline. David Beilby suggests you follow a link to his site. I suggest that anyone that has not looked at his GEC collection of Photos has a look, some of the interiors are the best internal shots I have seen. Sindalls had at least ten of these CHA952/968/972/976/977/981/982/985/989/992 In a recent article it was claimed eight of these went to PVD. One in Classic Bus had Sindall Fleet no 268. Which ones went to PVD and what registration was 268?